Perhaps it’s because I’m an October baby. Perhaps it’s the sight of skinny scarecrows in their denim & flannel, standing watch over dried cornfields. Perhaps it’s the growing darkness & thinning of the veil that lets us receive messages more clearly from those who have passed. For all those reasons, and more, October feeds my soul. I feel a greater connection to all that is across time & space, a humble sense of awe for the beauty around me, & a quieting of my spirit. My sister called with a very simple wish to fulfill… “We need a traditional fall experience. Fi and I will be there Friday night.” She need not say any more. 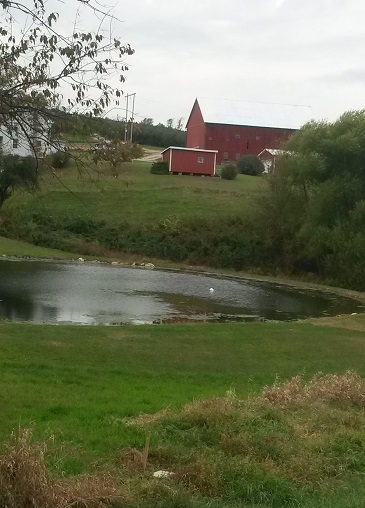 I knew exactly the kind of experience they would love– a crisp, cool day on a farm. 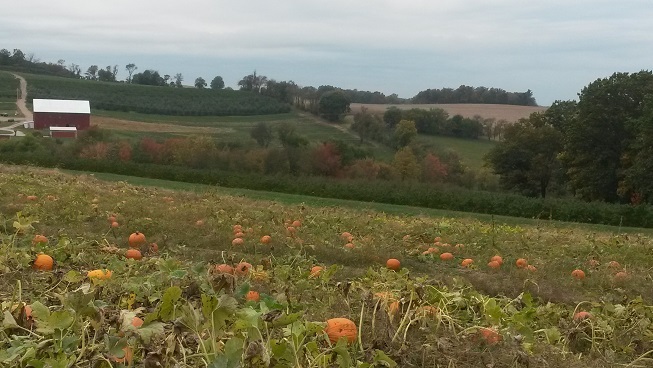 The next morning, we parked near the farmhouse surrounded by orchards dotted with bright red apples & fields dotted with bold orange pumpkins of all sizes. 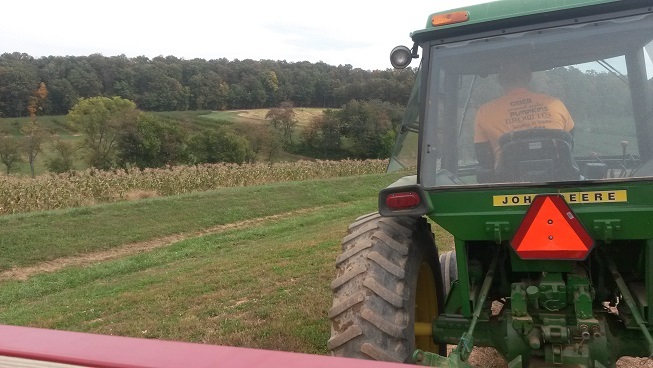 A John Deere tractor, pulling a wagon, stopped so we could climb aboard & sit on hay bales as the driver took us up to the orchard. Armed with empty bags, we jumped down & wandered among the trees, looking for apples to pick. Not all of them made it into our bags… one apple the size of a grapefruit tempted us too much. Like three Eves, we took enormous bites, letting the juice run down our wrists & soak our sleeves. 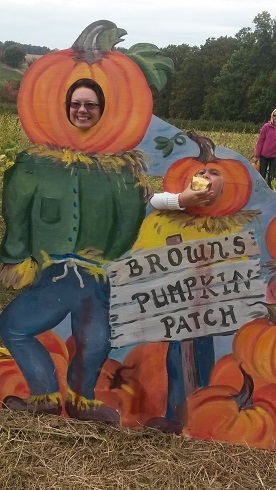 We munched leisurely & made our way to the pumpkin patch. Men & women of my generation will understand the reason why I immediately pictured Linus hugging a blue blanket, waiting patiently for the Great Pumpkin to arrive. (Secretly, I want to see him, too.) Choosing a pumpkin was difficult, for how do you choose the perfect pumpkin when they are all perfect? A young man with pruning sheers clipped the stems of our chosen pumpkins & we rolled the orbs into our arms, trying hard not to spill the bags of apples. Now we were both sticky & a bit dirty but isn’t that what it’s all about?… enjoying the moment to the fullest? By now, our cheeks & noses were as red as our apples & it was time to go but not before my sister & niece posed for one last photo. ‘Cause everything is holy now. We are physical, mental, emotional, spiritual beings and we are dreamers. Light in the Darkness: How Dreams Illuminate Your Soul is the title of the workshop I led for almost 50 people last Friday. I was glad to see people of both sexes, all ages from pre-teen to elderly, & a wide variety of faiths represented for this is a natural experience that has no boundaries. Our dreams have messages meant to illuminate our souls & guide our lives if we are aware of our personal symbols & have the courage to act on what feels right. My background includes over 30 years of dream journal writing & interpreting the dreams that resonate on a deeper level than ordinary dreams influenced by the day’s events. I believe the awake life informs my dreams & that my dream life informs my awake life- two aspects of my total being. Over the years, I’ve studied the work of Rudolf Steiner, Carl Jung, Sandra Ingerman & other shamanic practitioners, & Robert Moss. His particular viewpoint seems very much aligned with mine. Writers coming from a shamanic background or those with native influences understand the importance of dreams for they can impact the individual and even the entire community. I spent part of the evening describing different types of dreams from daydreams that we have when we are totally awake to lucid dreaming (that in-between state where we are aware of dreaming) to night dreams that occur while our body is asleep. These “asleep dreams” were my focus. Dreams are your personal oracles, coming to you in ways you can understand with imagery that means something special to you. Even if archetypal symbols such as angels, fairies, Mother Earth, Merlin, an eagle, a cave, or the Tree of Life appear, they are appearing because they have personal meaning in addition to their cultural symbolism. Messages are always for your greatest & highest good. Nightmares, although terrifying at the time, are unique opportunities to face our fears, reflect, explore, & grow. For each of those examples, participants had dreams to share, dreams that demonstrated the importance of recalling the dream & opening to the dream’s message. I was very clear to state several times that only the dreamer can accurately interpret his or her dream. I can suggest strategies to improve dream interpretation but I cannot say what the dream means for the dreamer. Even dream dictionaries & books about symbols can only scratch the surface. You’ll know when an interpretation is correct by the way it makes you feel. This is an intuitive process. It’s not at all surprising that profound things happen when participants share their dreams & perform reenactments. I look forward to going through my own dream journals to discover even more about this fascinating phenomenon that defies scientific explanation. Yes, we can study REM sleep & brain waves but the mystical messages & imagery in dreams remains a mystery. For years, I’ve led women’s workshops on a variety of topics from goddess cultures to the Burning Times to the Divine Feminine in modern culture. While I’m the one planning & preparing the workshops, I humbly admit that they are made rich & provocative by the intelligent, interesting women who attend. At first, I used curricula designed by others such as Cakes for the Queen of Heaven 1 & 2 by Rev. Shirley Ranck and Rise Up & Call Her Name by Liz Fisher but when I could no longer find packaged programs, I created a 12-month program based loosely on the pagan Wheel of the Year & how the changes in nature mirror the changes in ourselves. It connected us to the past, each other, & our Highest Selves. “What do you want?”, I asked. 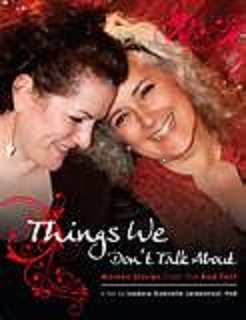 “More!” was the overwhelming response so I set to work looking for new inspiration & very quickly found “Things We Don’t Talk About: Women’s Stories from the Red Tent“, Dr. Isadora Gabrielle Leidenfrost’s documentary inspired by The Red Tent, Anita Diamant’s New York Times Bestselling book. I loved the book & couldn’t wait to view the movie. It exceeded my expectations. The summary on the back of the DVD says “…A Red Tent is a red textile space where women gather to rest, renew, & often share deep & powerful stories about their lives. The Red Tent movement is changing the way that women interact & support each other by providing a place that honors & celebrates women, & by enabling open conversations about the things that women don’t want to talk about in other venues.” THIS SOUNDS PERFECT FOR US. Almost unanimously & in unison, they said, “When do we start our own?” I laughed & got excited about the possibility. 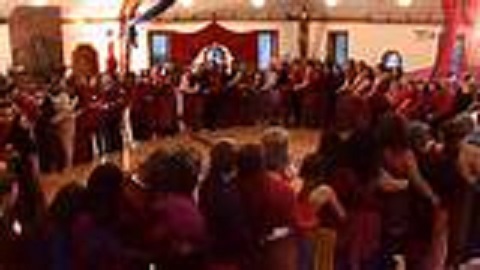 All over the world & most definitely in neighborhoods around this country, women are yearning for deeper connections & taking it upon themselves to form groups such as the Red Tent Temple movement started by Alisa Starkweather (co-producer of the movie). My Women’s Spirit Circle also came out of a desire to care for ourselves as we care for one another, honoring every stage of our lives from girl to crone. Red Tents are places where we can explore any topic including sexuality, the decision to have children or not have children, menopause, aging, relationships, & our first periods. Nothing is taboo. In the tent, we can give each other massages, perform Reiki & reflexology, create art, sleep, write in journals, share, laugh, cry, drum, dance, chant, meditate, talk, listen, & most importantly- hold sacred space where we can be our authentic selves. As I learn more about the movement & consider a way to make it a reality where I live, I readily admit I don’t know where the idea will go from here. All I know is that I want to make it a reality & let it take on a life of it’s own. What’s meant to be will be.